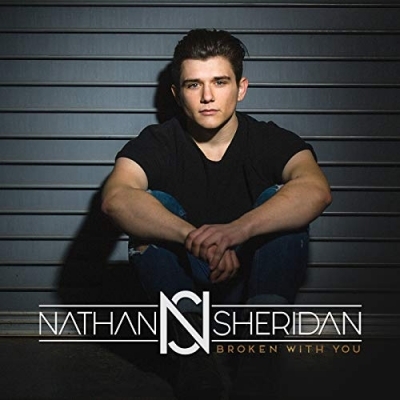 Singer/songwriter Nathan Sheridan released his 'Broken With You' album last year, drawing on the young artist's powerful life story of overcoming profound adversity and loss. It's an album that clearly resonated with LTTM's visitors, who have just voted it as the #1 Album of The Year in the LTTM Award 2018. So LTTM decided to catch up with Nathan and find out more about him. My Journey into music has been adventurous to say the least. I wasn't particularly musical growing up but I asked for a guitar for 15'th birthday and jumped into music. Before I knew it I was playing with the Youth band at my church. I started playing in church and even lead a few summer camps. But I never saw music, especially christian music, as a viable path for my life. I needed to get a job and do something with my life and surely music wasn't an option. So I joined the military and ended up getting deploy to Kuwait for a year. Before I knew it I was asked to lead worship for the soldiers on base every Wednesday and Sunday. Tell us about your new album ? My new album is called "Broken With You" and it's really filled with so many different themes. The title track is about my journey from having drug-addicted parents to finding redemption in Jesus and realizing that he's been by side all along. Some songs like "Starts With You and Me" are just about coming together as a people and finding common ground in Christ. Some of the songs are just straight up worship songs that glorify God. I wanted to put a little of everything in there. I wanted to make it personal and relatable all at the same time, and I wanted to make sure God was glorified as well. What is your favourite song on the album ? My song "Again" is by far my favorite track on the album. It's so deeply personal to me so it's hard for it not to be my favorite. The song talks about my grandparents who I love deeply, my sister passing away at a young age, and being married to my wonderful wife. It talks about how sometimes we just wish the world would stop for a while, and how we wish we could re-live some of the precious memories we have with the ones we love. There are some strong and heartfelt songs on the album, did you find these hard to write ? At times, yes. But it's not the writing of the song that is hard necessarily. It's knowing that, eventually, I will have to share this song with other people and become very vulnerable. Sometimes you stop during the writing process and have to make a decision on whether you really want to be THAT vulnerable or not. It can be an anxious feeling, but so far I have had nothing but good things said about my songs that get "deep". People seem to love the rawness and transparency. So I think I will continue down that path, and try to keep things real and heartfelt. Do you think artists should be more honest in their music ? Definitely! I'm biased though because I love songs that are honest and from the heart. I crave songs that relate to me and make me "feel" something. I also have a very special place in my heart for worship. At the end of the day, however, I won't judge any artist who chooses to write a song for radio or just wants to make a fun summer pop track. I love songs like that as well. There's a place for it all, and all of it is needed. "I would love to write a song with Phil Wickham. I love his worship songwriting and the melodies he comes up with. He's a pretty extraordinary talent. I also wouldn't mind writing with Ed Sheeran one day, that would be pretty awesome! How would you describe your style of music and what are your influences ? So far I haven't really landed on a specific style. I have songs that can be played in a coffeehouse that are chilled out and mellow. I have songs that you can worship to in your church or in your prayer closet. I have songs you could fit in with the current Pop CCM style. It's all there and I have so many different influences. Folk, Soul, Pop, Funk, Country. I really do love it all. I may narrow it down on my next album but so far I've really been enjoying getting to dabble in all of it and just go where the song leads. How would you define success in your career ? I just want to reach people and show them Christ. My goal is that people will know Christ through the testimony I share every time I get on a stage, and through the songs, I sing. If I can just do that for the rest of my life, I will consider it a success. I believe if I just keep that as the focus, then God will bless my ministry and my career beyond what was expected. The money, the platform, the fame is all secondary to furthering his kingdom. And even if he doesn't give me any of those things, I'll be just fine. It's not about me in the first place. What is your favourite album of all time ? Gregory Alan Isakov with The Colorado Symphony. It's about as perfect as music can get in my eyes. A true masterpiece! It's a shame he isn't more well known. You're stuck on an island, it's hot, you only have enough battery life left to listen to one song on your mp3 player. What track is it ? Who still has an Mp3 player? Okay, I guess I would listen to "Somewhere Over The Rainbow" by Israel "IZ" Kamakawiwo'ole. It's got an islander vibe, and that version of the song always gives me some peace and puts me to sleep. And since I'm probably not going to make it on an island in the middle of the ocean, I might as well go out with some peace and a smile! What does the next year hold for Inspiration Nathan Sheridan ? 2019 is off to a great start! I'm already back in the studio writing music and creating new sounds. I'm releasing a single off my album to radio right now! I just got done with a feature on the 700 Club which was amazing. I was able to share my testimony with millions of people across the world which was humbling to say the least. I'm feeling very inspired and very blessed. God made a way in 2018 and I know he will make a way in 2019!